Yes! The only requirement to enroll at the Arcade Academy is that you are at least 18 years of age. I already have improv experience, do I need to start at Improv 101? We ask that everyone start with Improv 101. Each improv theater or troupe has its own philosophy and style — and so do we. In order to learn ours from start to finish, you should begin at the beginning. If you sign up for an advanced class without having taken earlier ones, we won’t be able to admit you to the class. Nope. No audition required. It’s possible you may see auditions advertised from time to time for upcoming shows happening at the Arcade but… that’s not this. How much are classes and workshops? The cost of our classes and workshops depend many factors such as length of class, what it entails, specialized instructors, etc. Most of our classes are $225 for eight weeks of training, and this typically includes a final performance for friends, family, and community. You can pay for classes safely and securely online through Arcade’s ticketing vendor ShowClix. We do! We have a limited number of internships for eager, passionate, professional people who want to be a part of the Arcade team. Interns receive reduced or free classes in exchange for volunteering at our theater. Learn more about our internship program. Heck yea! Along with your tuition comes free admission to most of our Arcade Comedy shows. Students can use their Academy ID card at the box office to obtain a ticket for any show with available seats. All shows subject to availability. These fine people. Arcade reserves the right to substitute or replace one of our expertly trained teachers for another of our expertly trained teachers with little or no prior notice. If I take classes with you, can I get on an Arcade House Team? Sorry, classes are not a guarantee of being on a house team at the Arcade. But it’s a good start. It’s where we will first look for talent for many of our shows. We want you. We need you. Class without you is… less awesome. If you have to miss, please give your instructor a heads up. Keep in mind that more than 2 absences in a term will require you to repeat the level. Payment must be made at the time of enrollment in order to secure your spot in workshops and classes. All class and workshop registrations are non-refundable and non-transferable. Email our Academy Manager, Robin Hitchcock, with your specific question and she’ll get back to you right away. 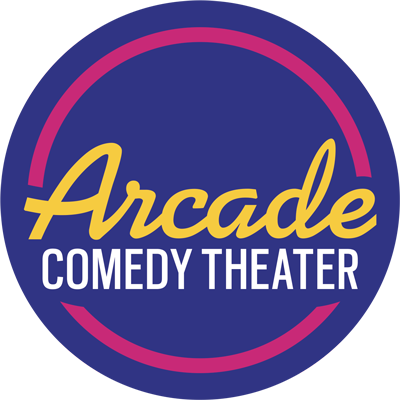 Arcade Comedy Theater strives to provide a safe and welcoming environment for performers, students, staff and patrons. To read our Policy Against Harassment, please click the button below.